If you're making a back to school list, there are some school supplies you can always count on needing. Let's take a closer look items every child needs. Whether your child is in elementary school or high school, your child will need the following items. If your child is elementary school, you'll want to stick with pencils. All children should have at least one pack of #2 pencils for taking tests. If your child is in middle school or high school, you can get a variety of pens and pencils to go with the standard #2 pencils. If you have the extra money, splurge and get some gel pens in fun colors. Or if your kids like crafts and art projects, why not have them make these easy DIY washi tape pencils to help get in the back to school spirit? All children will also need some sort of paper to write on. Whether you're buying notebooks or loose leaf paper, it pays to buy both wide and college-ruled paper. Some teachers have a preference on which to use. 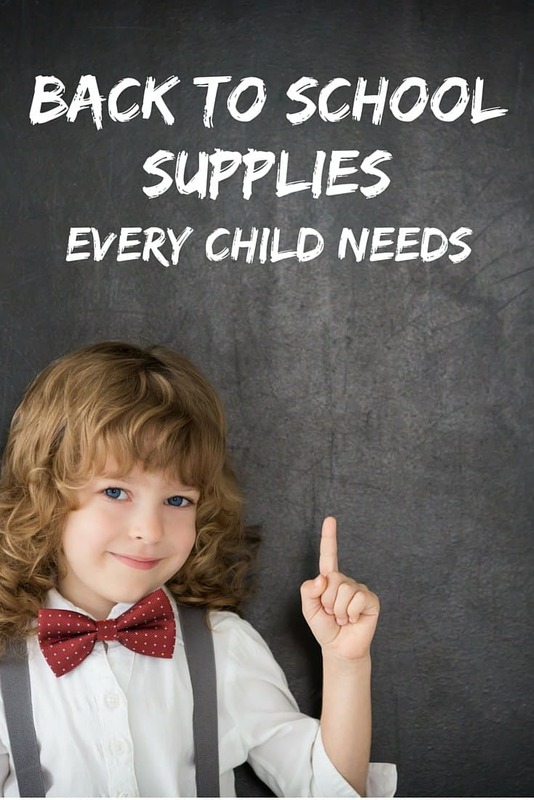 If your school puts out a list of supplies needed each year, check to see what your child will need for the year. If there's no preference, ask your child what he prefers. Binders are folders are great for keeping kids organized. You can find binders and folders in a variety of fun colors and patterns. Take your child with you to pick out what she likes. You can find colorful folders in most stores, even dollar stores. The exact supplies will depend on the age of your child. For example, elementary school students will need crayons and markers. However, colored pencils are used all the way through high school. Every child needs a backpack. Smaller kids will need something to keep everything contained and older kids will need something to help them carry their heavy textbooks. This is something you should allow your child to pick on his own, especially if he's older. Organizers come in handy everywhere, even at school. Younger kids will need pencil cases to help keep them organized, while older kids can benefit from locker organizers. You can find so many different kinds of locker organizers on Amazon or in office supply stores. Middle school and high school students should have a student planner to write their homework assignments in and track project due dates. Even elementary students can benefit from using a planner as it helps them to get used to tracking their assignments early on. Last, but not least, every child should have hand sanitizer. Schools are one of the worst places for the common cold. Teach your child from an early age to use hand sanitizer throughout the day to help ward off germs. There you have it. These are supplies that every child, no matter what age or grade, will need. If you spot great deals while out shopping, grab them. You don't have to wait for the shopping list to get some of the back to school supplies your child will need. « What Makes a True Friend? Great post! You have definitely covered all the essentials. Hard to believe it is back to school time already. Before we know it, it will be Christmas time! Your checklist is spot on. Check out Amazon too for great prices! This list will help me a lot. Thanks for sharing. When I was a kid I loved shopping for back to school supplies with mom. I remember hoping they’d send out the official school supply list early so I could take advantage of all the BTS deals. These are all supplies that are safe to get whenever they’re on sale.